Snowy pavements are not the same as pavements with broken paving stones – both of them can cause you to trip and fall, but the former happens all at once when it snows heavily, while the latter happens gradually over the years. That’s why countries like Belgium* and Germany have different approaches to these two issues. When it snows it’s the responsibility of the home or business owner to clear the pavements of snow in front of their property. If the paving stones are broken or dangerous it’s the responsibility of local government. Apparently people have deliberately not been clearing public spaces in the UK previously – for fear of being sued! It’s impossible for local government to have the staffing resources (let alone the grit) to be able to clear each and every pavement at the moment it snows heavily. By spreading this burden among building owners, each bearing a small responsibility, the problem of slippery, snowy pavements can be resolved much more quickly. There would of course have to be exceptions (for the elderly for example) but as a starting point, why not? How about that as an idea to be considered by Philip Hammond when he’s wondering what to do for snow response in future? Surely fits closely with the Big Society ideas of the Tories? * – before I get any sarcastic comments from Belgian readers, I know there are plenty of missing and broken paving stones on Belgian pavements! @Anne – interesting! On that note I would craw your attention to Cory Booker, Mayor of Newark, NJ, who has been coordinating snow clearance via Twitter, and now that’s done he’s promoting #LetsMove, a community fitness programme (on Twitter here) – perfect match! Get the city fit, then they can clear snow? 1. A good friend of mine is a heart surgeon in the States and she says most heart attacks are caused by sedentary men shovelling snow. Although this broadly seems a good idea, there are a few things against. One is that older people, not only elderly, are at a higher chance of heart attacks from overexertion clearing snow. This would include overweight men over 45 for example. Second, I currently live in Lund in southern Sweden. Here the council does clear every pavement, and daily too. So it is possible. Obviously they must put more resources into this – including having small snow plough vehicles, able to clear pavements. 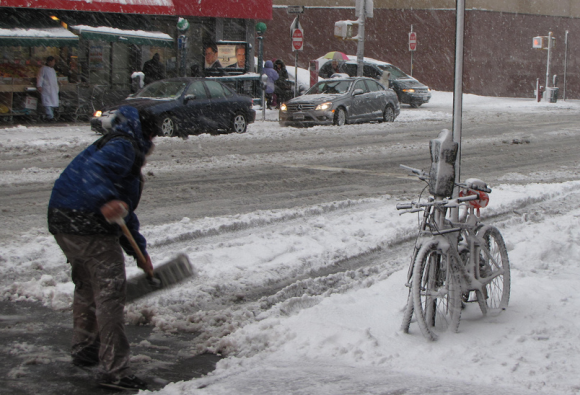 But it is much more efficient that clearing with shovels; they can clear 1 km in maybe 10 minutes. How long would that take with a shovel?